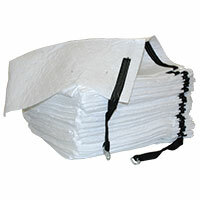 Sorbent sweeps are a durable, easy-to-use absorbent. At 100 feet in length the sweep, named for its sweeping action on the surface of water, gathers up that hard-to-get sheen that can appear when a small amount of oil or oil-based liquid spreads across water. Lay a sweep across a stream or storm-water discharge tube, or drag it behind a boat. Webbing reinforcement is sewn into the hem, making our sweep tough--so go ahead and pull! Each one of our sorbent pillows (AND1425) can soak up to four gallons! Put a rope on the end and you can use it in your storm drain to catch all that oily run off. Use our Mini-Pillows (AND6915 and AND7915) around machinery, under faucets, spigots, hydraulic hoses, and coolant lines. You can even put them under equipment and into really tight areas because of their low-profile design. The Oil-selective Mini-Pillow will float on water and only soak up oil and oil-based fluids. Keep a box near dispensing and drum storage areas. And remember, you can get your own size! Just give us a call. Sometimes you need an on-the-spot solution to... well, a spot. 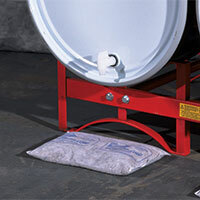 Spills can wreak havoc on work floors and spaces, and bulk sorbents are a quick way to soak up unexpected accidents. We offer two types, both available in 10lb. bags or a custom amount - just call and we can customize! 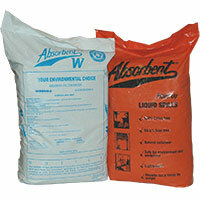 Keep a bag of our General-purpose Sorbent handy for leaks and drips in and around your loading docks! It will even soak up antifreeze. Plus it's 99% dust free. This recycled cellulose Sorbent soaks up oils, fuels, and solvents - not water! Works great indoors or outdoors. Incinerates to less than 1% ash. SCS Green Cross Certified. Nothing says you care more about your shop and equipment than using an Andax Drip Shield™! 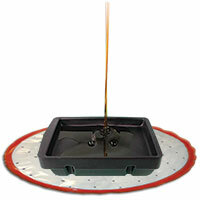 Place a Drip Shield™ under a container on the floor, on a work bench, in the lab or even under a dripping pipe! Since the Drip Shield™ aborbent drip pad has a tough poly backing, leaks will never touch the surface the Drip Shield™ protects. Keep your workplace clean and safe. Available in oil-selective or universal configurations.